We can help your with your photo request. 5. Digital makeover of person like slimming, removing wrinkles, neck tuck and more. Can your photo be repaired? We repair 99% of all photos we see. We repair scratches, replace missing or damaged areas, remove water damage, remove wrinkles and more. What are the steps in repair a photo? First we scan your photo. We do not apply any changes to your orginal photo. All changes are completed digitaly. Next we digitally repair your photo. Last we can print your photo and give you a CD with your digital repair (cd free on order $20 or more)..
Do I need to worry about my photo? All photos are handled with great care. Your photo will be handled the same was the holocaust negative we scanned for one of our customers. 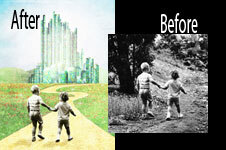 See below for photo repair samples. Click here for photo editing samples and collage.